I am considering moving to an all in one head unit. I like my aftermarket Alpine Double DIN Stereo, but I really want a backup camera and a better NAV solution. I have been considering one of the large Garmin units on top of the dash. The Garmin RV 760LMT with Wireless Backup Camera, and the Garmin nüvi 2798LMT Portable GPS with Backup Camera. They look like the same 7" diameter monitor unit and have the same wireless camera. I am pretty sure that the software is the only real difference. Well, that and a hundred dollars. After seeing the unit in person I realize that I really do not want to add that much to the top of my dash. While I like the idea of being able to see it better, because of it's size, I think it will just be another giant Garmin cable end, attached to the 12v socket right next to the shift lever. Not real fond of that. I also have reservations about the wireless camera, but LOVE the Garmin interface. So, now I am thinking about an all in one head unit and I am getting mixed signals. I like the idea of having a cleaner looking dash. I am not an audiophile and the current Alpine head unit is great. I know Kenwood uses the Garmin Nav goodies. I have had two different installers say that they like them but it can take up to a few minutes to boot up the system, and it drives them nuts. Are they full of it? Are any of you having that issue? I know I read it around here that someone had that problem. It could be that most of these threads were written prior to Kenwood and Garmin teaming up. I don't know? Pioneer also makes good gear, but I do not know how the NAV works, if it is much different from the Garmin. What is the NAV system like that Pioneer uses? How about the other systems of these manufacturers. What do you like/don't like about the Kenwood systems? What do you like/don't like about the Pioneer systems? Re: All In One Double DIN Unit - Kenwood or Pioneer? I know it is not a high end brand, but my Jensen VX7020 is working great. I got the radio, install kit and back up camera for less then $500. It has Nav, DVD, Bluetooth, Pandora, aux inputs/outputs(video) and Sirius radio. I added some new component door speakers, rear door 6x9s and a 6 1/2 bazooka tube. It sounds great. I have the Kenwood DNX6990 in my van & it takes under a minute to boot. Somewhat annoying but not too bad. 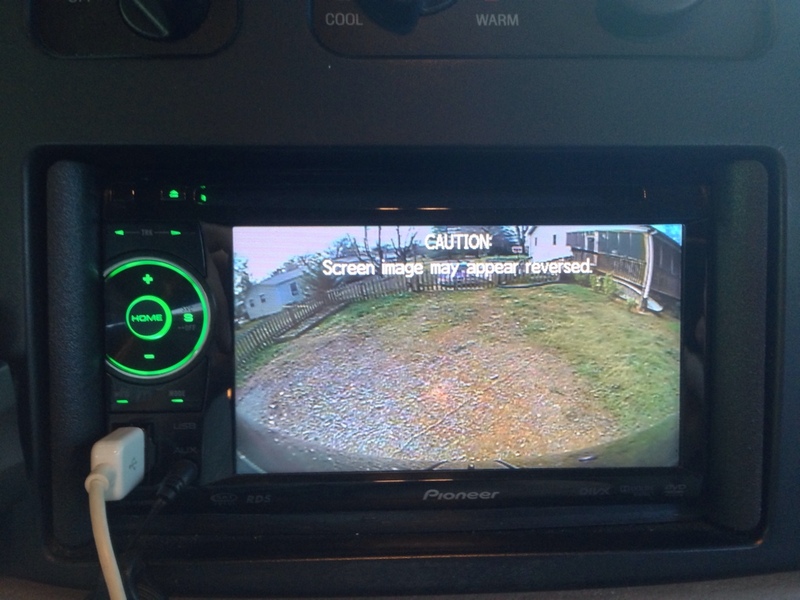 The backup camera works before the unit boots so you don't need to wait for it to boot in order to use the camera. I put in a Kenwood DNX-690HD in our E-350 2 years ago. Overall, I like it. It does take a while for the nav to boot, but the radio comes on in about 5-8 seconds. And like rltilley said, the backup cam is usable almost immediately. That's a nice feature, and waiting for the rest doesn't really bother me since I like the diesel to warm up a bit before moving out. -The graphics chip is kind of slow to keep up with the animations of the onscreen icons and buttons. -About 5% of the time, the satellite station you left it on when you shut the van off produces silence when you start the van again. Solution is to change the station preset and then go back again. -The system crashes, though rarely lately. Often, the volume control display won't go away from the screen. When that happens, I've had to power the head unit down/up. -It has a physical rotary knob for the volume control. I don't have to take eyes off the road to adjust the volume. This is a bigger plus than you can imagine when you're shopping online for head units. -The Garmin nav portion in it is pretty good for on-road use. Off-road, it's not going to help you a lot. -It was easy to install, partially thanks to Crutchfield's "free" install kit. -I just started using the Bluetooth/iPhone music function on the last trip. There's a tiny lag in responsiveness when FFWDing through tracks due to the Bluetooth, but otherwise it's awesome. Makes me wish I didn't spend the money on the USB interface cable now. -The handsfree function works great, except that I have a noisy diesel. The caller sometimes has trouble hearing me over the engine noise, but that's not the Kenwood's fault. Best system I have had yet in 45 cars over the years. Watch videos from the rear couch. Back up camera AWESOME. Blue tooth over 2,000 of my most favorite artist. Never have to listen to another radio ad, priceless! I've had both Kenwood and Pioneer units. Both are pretty equal in performance IMO, but I give the edge to Kenwood. I've been running a Kenwood double-DIN DVD (non-gps) unit in my Sportsmobile for about three years now and have been pleased with it. I went back and forth about whether to get a unit with built-in GPS vs. a stand-alone Garmin. In the end I went with the stand-alone Garmin nav, for two reasons: 1) cost, and 2) ongoing map updates. With the Kenwood, Pioneer, etc., units I've found that the map upgrades can be costly. If you get a stand-alone Garmin with "lifetime" maps, then you are set for a while. But, I do agree that having the GPS built into the head unit is much more convenient. It's nice to have the nav "always on" and ready to use. Generally, we only pull the Garmin out when we are headed on a trip somewhere and know we'll be using it enough to plug it in and all that. Otherwise, it's in the glove compartment. Back when we had a built-in nav it was nice to be able to access it on the fly if we wanted to get around a traffic jam, etc. Regarding start-up times, sophisticated stereo/gps headunits are basically small computers. Just like you laptop, they need a few second to boot up, load info (maps, waypoints, etc.) into memory, etc. I think it's just the price you pay for having a do-it-all stereo. Even my non-nav headunit takes a second or two to start up. The only time it's annoying is when I'm starting up and backing up and want to see my rear camera immediately. As Photographix noted, having the physical volume knob on the Kenwood is a really nice feature, and one of the things that ultimately swayed me to the Kenwood over other units we were looking at. If you have steering-wheel controls, though, it's probably less of a factor. When I installed our Kenwood I did the "video bypass," which allows DVDs to be viewed even while the car is in motion. On my Kenwood it was as easy as grounding one of the wires in the harness. I did this mainly to allow my son (sitting in the second-row captain's seat) to be able to watch videos on long drives. While wiring it up, I also ran a video RCA cable from the headunit's RCA video-out port back to driver's side B-pillar. There, I split it into two video cable streams. One I ran to the back of the van, the other up to the cab headliner near where the courtesy light is. Although I haven't made active use of either of these cables yet, the plan is to install a flat-screen TV in the rear and/or a drop-down screen in the cab headliner, facing the rear. The idea is to be able to play a video in the dash headunit and be able to watch the video stream on either of these screens while listening to the sound through the van's stereo system. I had a Pioneer in my last van. 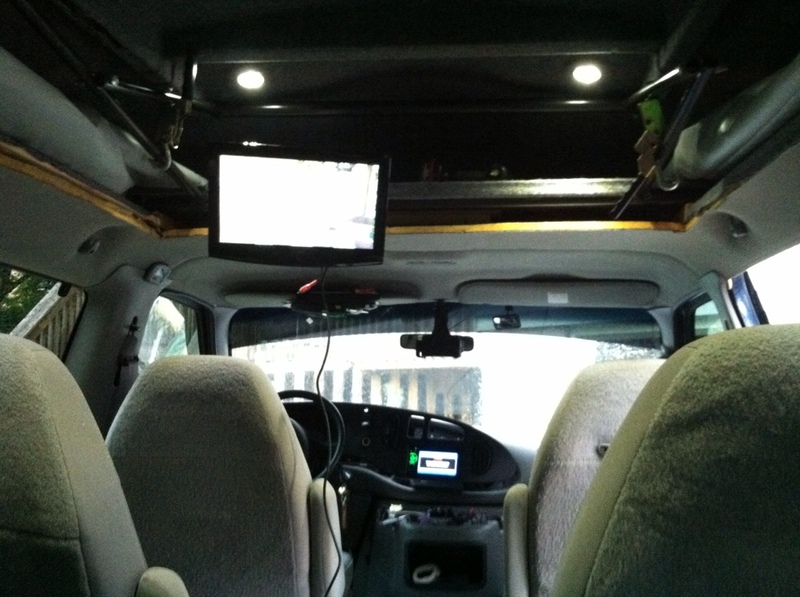 Loved the double din screen for reverse camera and DVD option, and most have an RCA out for a monitor, which we wired to our 19" TV in the back of the van. That part was awesome. Also, you can choose rear camera on constant, which I prefer for my main screen while driving. When you tap the screen the previous screen comes up, DVD, tuner, ipod/aux or whatever you're using. Cons: Mine had touch volume control, not a rotary knob. I highly recommend getting one with an actual knob as noted above. Also, the rear camera constantly displays the message 'objects in camera may be reversed', which you cannot turn off. This is probably standard for all Pioneers at least, and I've seen it on some other brand stereo in some vehicle I was in. Another thing I would look for in a new one is an RF remote, since it's a camper van. I like to be able to use a remote from any seat or possibly right outside at a campsite. I'm not even sure if these are common in car stereos but they should be. See how that stupid message mucks up your view? You can't turn it off! My Kenwood with rear camera doesn't have that message. Although, it always pops up a disclaimer when in reverse-view mode, and you have to touch it for it to go away (annoying). I'm running a Kenwood CMOS camera to a Kenwood headunit; maybe third-party cameras would trigger the reversed-image message? Thanks all for the quick responses. I did not know that the backup camera did not take the same time to load as the NAV. I too like a rotary knob and along with the Garmin NAV interface that was one of the real plusses for the Kenwood. Thanks! Do all of the rear camera monitors have lines that are configurable as far as you know? How is the NAV system in the Pioneer models? My Pioneer did not have Nav. As far as the lines, do you mean distance lines for backing up? If not I'm not sure what you mean. I do not remember if mind had those or not, but if so I turned them off.